Instructor Course: Teach basic lessons, conduct paddle tours, rentals on exposed waters. 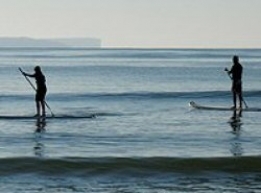 This instructor's course is for teaching SUP activities in coastal beaches and bays and harbours and large inland bodies of water (with no breaking waves). BONUS: A personal SUP Paddling Video Assessment with review is included in the workshop, so you can assess your own paddling technique. On successful completion of this course, instructors are elgible to enrol in the ASI Level 2 SUP Technical Coach (Exposed Waters) course. Plan and conduct basic stand up paddle sessions, short SUP paddle tours and SUP rentals and manage clients safely in exposed waters locations. Paddle with correct paddling technique, confidence and safety in exposed waters locations, demonstrating: paddle with the board in trim / change hands correctly / correct posture with hinging from the hips, back straight and eyes looking ahead / correct reach / paddle vertical at entry / feathering paddle at exit / paddle in a straight line / turn and stop effectively / negotiate swell up to 2ft (not breaking waves). Complete 10 hours assisting in exposed waters SUP instruction at an ASI accredited or other approved SUP school. (Exemption: recognition of previous experience can be provided). Note: You can enrol in the ASI Level 2 course at the same time as completing Level 1 course. If you are not able to demonstrate competent exposed waters paddling skills at the workshop, one additional video assessment can be submitted for free. Work at your own pace. We post out your instructor manuals. Complete assessments and practical on-the-job instruction experience to suit your schedule. Ideal for: students who are working with an ASI Accredited SUP School, are experienced paddlers, with some previous instruction experience and require flexibility in completing their qualification.